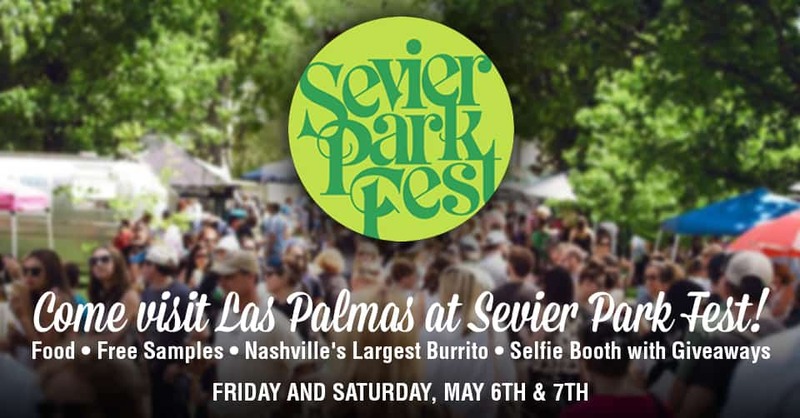 Las Palmas Mexican Restaurant is excited to announce the debut of Nashville’s Largest Burrito at Sevier Park Fest 2016 in the 12th South neighborhood on Saturday, May 7th. The authentic Mexican-style burrito is expected to be 6 feet long with delicious samples available to festival attendees. The Nashville-based restaurant is also thrilled to be participating as a sponsor and food vendor for the 4th annual neighborhood festival that takes place in Sevier Park and along 12th South Avenue. They will be serving up their renowned Mexican fare for the Friday night concert featuring Blues Traveler, Kansas Bible Company and Isaac Hayden, as well as throughout the festivities on Saturday. Las Palmas will have a designated selfie booth with prizes for those who post using their popular hashtag #IWantLasPalmas. The restaurant has also teamed up with The Nashville Sign to live stream the feed to their billboard at the split of Broadway and West End. Las Palmas Mexican Restaurant has been serving fresh, authentic Mexican food to the Nashville community for over 25 years. They are family owned and operated with 10 locations in the Nashville area. For more information, please visit laspalmasnashville.com and follow us on social media @laspalmasnash.